I'd like to say thank you for having patience in helping me become more confident in my driving ability. I will definitely recommend you due to the great teaching style and personality that make lessons much more understandable and fun. Thank you again. Andrew is a great instructor. He's really patient and happily works at your own individual pace, never making you feel out of your depth. He is very flexible which helped me to achieve my goal quickly and his friendly calm and collected nature kept me focused when I needed to be. Thanks for all your help Andrew, I would highly recommend! I could not recommend Andrew enough. He is very reliable, organised and he assisted to all my needs. He gave me so much confidence and believes in everyone. His calm nature means he is very easy to get along with and is very calm which puts you at ease and he never makes you feel out of control. I have and will continue to recommend Andrew as he is an amazing instructor! Would not have gone anywhere else! Thank you so much Andrew! Andrew is very easy to get along with. I passed first time. I would recommend Andrew to anyone that wants to learn how to drive. Great teacher! Learnt so much so quickly. Andrew was really helpful if I struggled with anything - very friendly and clear. Would recommend! Having come from another instructor I didn't like and ready to give up after one lesson Andrew gave me the confidence that I could learn to drive. Andrew is very calm and collected person and is also very understanding that driving can be extremely nerve wracking for some people. Absolutely worth the money, I personally wouldn't of gone anywhere else even if it were offered to me at half price. I would recommend 10/10. Andrew is very friendly and gives you the support and confidence you need. He doesn’t let you doubt yourself and is very easy to get along with. I can’t thank him enough for helping me and for helping me with my confidence when driving. He’s very chilled and easy to talk to and is sometimes funny. I have recommended him to my friends and will continue to do so. Thank you!! I am over the moon! Andrew was an amazing Instructor he was always calm and relaxed despite my nerves. He listened to me and my concerns and we planned the lessons together. He gave good advice and easy to remember techniques and I passed my test in five months. I would definitely recommend Andrew to anyone who is interested in driving. 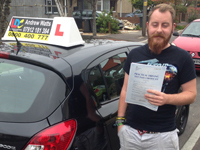 Andrew immediately listened to my concerns and anxieties about driving and tailored his teaching around the way I learned best. I always felt secure in the car, and knew that I was in good hands! I'd recommend Andrew's wonderful teaching to my friends for sure! 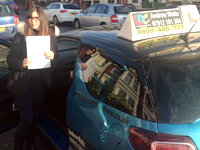 Andrew helped me to pass my test first time! He is very calm, a great teacher, and is very easy to get along with. 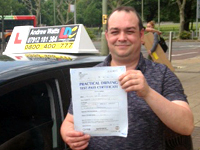 Andrew made everything easy to understand, and helped me become a calm and confident driver. 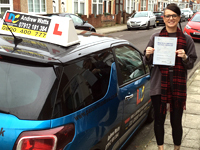 A fantastic driving instructor who I would highly recommend to everyone! I have been learning to drive on and off for the last four years and have taken my test in four different places with three different instructors because I have moved around so much. When I met Andrew, my confidence in driving had been knocked. He quickly changed my outlook and I even started to enjoy driving. Without him I would have given up a long time ago. He is the best instructor I could ask for. Andrew is patient on the bad days and funny on the good days. Would 100% recommend to a friend!! Thank you for teaching me, it's been a pleasure and I couldn't have asked for a better instructor. Thanks a million. Andrew is friendly, patient, reliable and soft spoken. He always explained things clearly and never grew tired of my many questions. It is probably fair to say I was one of the most anxious learners ever, and Andrew was great at putting me at ease and helped me become more confident. I honestly cannot ask for more in an instructor, and I cannot recommend him highly enough! Thank you for helping me pass, at seven months pregnant! Can't thank Andrew enough, what an amazing instructor! 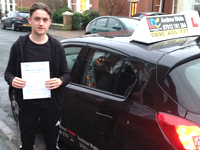 Having had no driving experience before, he helped calm my nerves that I had in my first lesson through to the test. 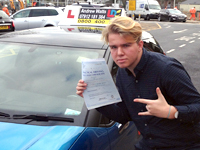 His patience and excellent teaching style (explaining how to improve techniques and great little tips) has undoubtedly helped me drive safely and pass my test first time, with only 11 weeks of lessons! I will recommend Andrew to anyone who is thinking about starting to learn to drive, thank you! 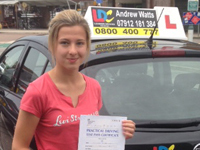 Hi Andrew, thank you so much for all your hard work in helping me pass my driving test. You gave me the confidence I needed after being knocked back a few times by previous instructors. You remained professional and patient with me and I really do appreciate it. I will be sure to recommend you to anyone looking to learn to drive. Andrew is friendly, approachable and easy to get along with, I learnt quickly with him and liked his method of teaching. I felt comfortable asking him any questions I had and he gave me opportunities to choose what I wanted to work on during each lesson. I passed first time with Andrew and would definitely recommend him. 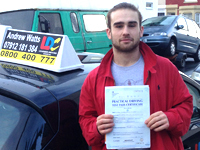 Andrew is a brilliant instructor, he got me passed first time in just 19 hours! He's very easy going, easy to get along with and very calm when teaching you. there's no shouting and screaming at you if you do something wrong! His Citron DS3 is a very nice car to learn in, very comfortable and easy to drive!, I couldn't recommend him enough! His hours are very flexible and he will always do his best to help you out and work around you! Will be putting him forward to all my family and friends! 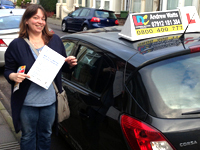 When starting driving lessons with Andrew I was nervous but soon became comfortable with driving. I loved the fact that when learning to drive with him we could have a laugh and banter and that he made learning fun and enjoyable and that makes a difference when I was learning. Whenever mistakes were made he stayed calm and made sure you were calm and he was patient with me. He made my experience of learning to drive so much easier to complete and got me to the level where I passed first time. I'm so happy that I learnt to drive with Andrew and I definitely recommend him as an instructor. 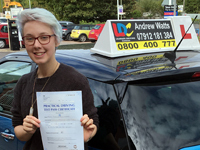 I am over the moon with my experience of learning to drive with Andrew. I had put off learning to drive for a few years due to nervousness but that soon went within a few lessons. He really built my confidence and made each lesson enjoyable. 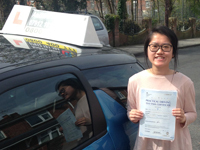 His relaxed nature and professionalism allowed me to pass my test knowing that I could drive both safely and confidently (I'm no longer afraid of parallel parking!) He is a very reliable instructor, and I wouldn't have gone anywhere else! Thank again Andrew for all of your help. 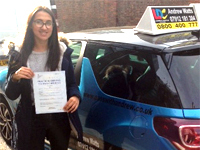 Thank you so much for a relaxed fun first driving lesson Andrew you made it great I look forward to my next one. 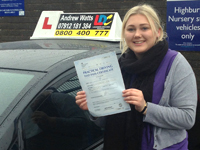 I was very pleased with my driving course with Andrew. He was always calm and patient with me and made me feel as relaxed as possible, he was very flexible with my hours making sure they fitted around my schedule, I would highly recommend. I'd like to thank Andrew so much for being a star and helping me pass my driving test. He is calm, patient and a very reliable teacher. He is very reassuring and will help you strive to be the best driver you can be! 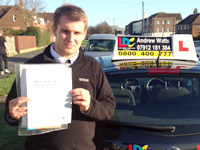 After having lessons with other instructors Andrew is in a league of his own. He is calm and patient and really listens to you. He is 100% a professional and I could not have passed without his advise and guidance. Would just like to say thank you for the hours you have put in for me to pass you have been a great instructor which has helped me get through it. I would recommend you to anyone starting their lessons. I would like to thank Andrew for helping me to pass my test. I would highly recommend him as a teacher. Andrew is a calm and patient instructor and will help you through the parts of driving that you do not feel comfortable doing. I am very grateful that he helped me get my pass. Thank you Andrew. Thanks to Andrew’s proficient tuition I was able to finally develop a life skill and learn to drive. Despite my reservations about learning, having waited over a decade to get started, Andrew was able to guide me to a first-time pass in a little under five months. His calm persona and thorough approach is matched with a friendly, yet professional attitude – even when I mounted a roundabout on one of my first few lessons! 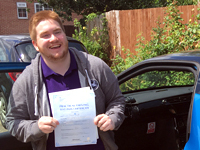 Andrew gave me the confidence to gain the added freedom that being able to drive grants. I would like to say a massive thank you to my incredible LDC instructor Andrew. 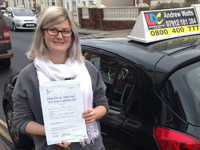 Having failed previously with a different driving school, I had lost all my confidence with learning to drive. 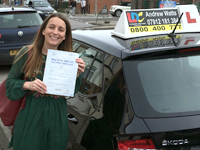 However, with Andrew's calm, friendly and motivating nature, he helped me to build up my confidence again and banish my nerves right away from the very first lesson I had with him, consistently up and towards the test date. Thanks to him, he taught me the right driving knowledge and skills to succeed and further develop my experience in driving. During lessons, I received constructive feedback on what I was doing well and what I needed to improve on, which kept me motivated. As well as this, Andrew's communication and arrival for lessons were always spot on and he was flexible to slot in lesson times to suit my schedule. Would thoroughly recommend him as an instructor. Thank you Andrew. 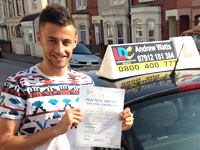 Andrew is a really good driving instructor, he stays calm and gives you confidence in the car. He only uses his controls if he needs too and helps you keep your confidence after a mistake by explaining and tells you how to improve. 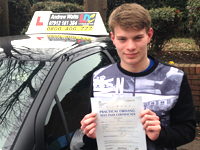 Andrew is an honest instructor and got me through my driving test quickly and with a pass first time. 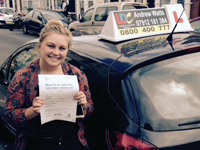 At first I was very nervous about learning to drive, but after a few lessons with Andrew my confidence grew. I highly recommend Andrew to anyone who wants to learn to drive. I found that he was extremely flexible which worked really well with working shifts and not having set times for lessons. He's patient, easy to get on with and an all round great teacher. I had never even driven a car before my first lesson and after 6 months of learning to drive with Andrew I passed my test first time! Thank you for everything Andrew! 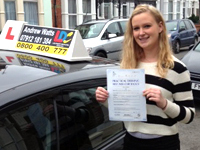 I did my driving lessons with Andrew and he was a very calm and patient instructor and will recommend him to anyone. 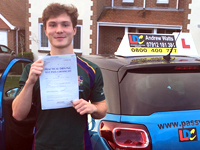 Andrew was a great instructor and helped me massively, he helped with developing my driving knowledge and my driving skills huge amounts and would recommend to anyone. 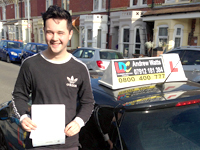 Cheers Andrew thanks for all your help will give your number to anyone who needs lessons. Cheers again! Thanks to Andrew I managed to pass my test on my first attempt, not only that but I felt confident enough to do so throughout our lessons. He has a calm and considerate attitude towards teaching which makes learning extremely easy and enjoyable. Also he manages to tailor techniques to aid you in areas you are not as confident in. I would recommend Andrew to anyone and everyone!! 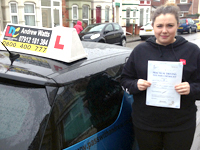 Hi Andrew, Am just emailing to thank you again for the support & instruction you have given me over the last 2 months to help me pass with 0 faults. thanks so much for helping me pass my test so well so soon. I will definitely be recommending you to all other friends. Thank you so much for everything! You are the best driving instructor ever! I will never be able thank Andrew enough for his help. 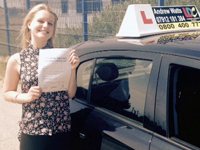 I was an extremely nervous driver who would worry about everything I did, when i started my lessons. But Andrew is an amazing driving instructor. He was calm and supportive, he never got frustrated with me. He helped me develop the skills and tools I need to be a good, calm and more confident driver and get over my nerves when driving. This made my lessons more enjoyable. I will always recommend Andrew for anyone wanting to learn to drive. So happy to have had Andrew as my instructor after many bad experiences with previous instructors. Easy to get along with, lovely person and puts you at ease when the nerves get to you. 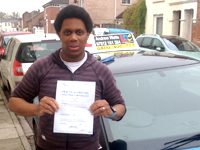 Am more than happy that I passed first time thanks to him. Thank you Andrew! 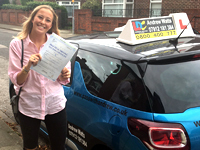 When starting lessons with Andrew I had already had many lessons before and had taken 5 driving tests in the Portsmouth area. 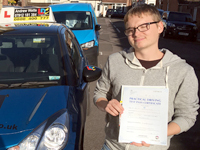 I decided to change my test to Lee on Solent and Andrew was more than happy to take my lessons there. After working with Andrew over the course of 3 months. I finally took my test in his car and passed. 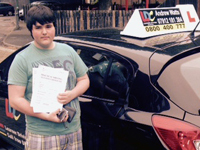 I found working on my driving with Andrew was easy as he is very patient and was willing to help me on all areas. 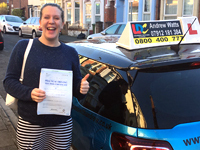 I would definitely recommend Andrew as a driving instructor as he has helped my driving come on leaps and bounds and also by helping me pass. I also found that Andrew was willing to be flexible around my working rota so there wasn't a time he wasn't available for a lesson. What a great experience I've had with you. You've been absolutely brilliant. Cheers for everything. It has been a fantastic week of intensive driving with Andrew and also a privilege to be taught by someone with such a good attitude when it comes to your strengths and weaknesses and also someone who is so easy to interact with and never makes you feel uncomfortable! A massive thank you goes out to him this past week for helping me to pass first time! To all future learners, I honestly couldn't recommend him enough! Andrew is a great instructor with a great sense of humour, which really puts you at ease with him right from the start of your driving experience. I can honestly recommend Andrew and I have found that learning with him has been an enjoyable experience. He was very honest with me also when I was waiting for my test date and wouldn’t book extra lessons in just to make money because he honestly said I was ready. 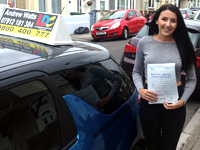 He gave me the skills and confidence, which allowed to me to pass my test. It can be difficult choosing an instructor suited to you as often you have to go through a company and don't get the chance to talk to the instructor until the first lesson . And if you've brought a bulk set of lessons it can then be hard to then change. I was so disappointed having to constantly chase to book a lesson I had to try someone else. I liked what I had heard about LDC but was still wary of not speaking to my instructor until the day. I need not have worried. Right from the start, Andrew was great. Prompt communications and never late for a lesson. Two things never demonstrated by my previous instructor! 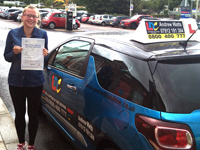 Whilst hoping I would only need a few lessons it turned out this was not the case and Andrew then advised me I should move my test date back as he no longer felt I was ready. It proved to be a spot on assessment and I admire Andrew for his honesty. Whilst it might have cost me a few extra lessons it did wonders for my confidence. 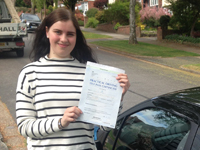 As a result I passed first time with only 3 minors. Andrew proved a great instructor. With patience in abundance, an ability to adapt his teaching style to the individual pupil's personality. He also has a canny knack of knowing how likely you are to preform on the day of your test. Providing excellent tuition along the way. Whilst there is never any guarantee of passing first time. In my opinion having Andrew as your instructor, gives you the best possible chance in achieving it. Glenn Hutchins. I would like to say Thank you. I had lost confidence with driving but you restored this with your patience and instruction to prepare me for the test which made me look forward to the lessons. After 10 hours of lessons I passed my test first time so I would recommend Andrew to anyone who wants to learn to drive. Great instructor, don't know how I would have passed without him. So reliable and very helpful. Finally passed after all the extra help he offered me. Can't wait to do my pass plus with this legend!! Words can't describe how much of a great instructor Andrew is! He's patient, friendly, he knows what he's doing and helps you to gain confidence on the road. I was so nervous to start driving at first but after my first lesson I was so excited for my next lesson and felt comfortable in the car with him. 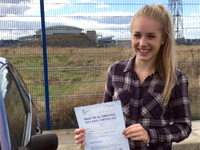 I then passed first time within the space of two months of learning! Absolutely amazing instructor and couldn't have asked for anyone better to teach me how to drive! Thank you so much Andrew, highly recommended to anybody in Portsmouth!! It has been an absolute pleasure to have been taught by such a kind and considerate instructor. Andrew has given me so much help and support throughout and has helped me to gain a lot of confidence. He is a great teacher who is extremely patient and works with you to achieve a can do attitude. Thank you for all your help you have been a brilliant instructor and I will definitely be recommending you. A massive thank you to Andrew for being a fantastic instructor. I had three other instructors before Andrew but each one was not able to meet my requirements. Andrew is very patient, understanding, and a fantastic teacher. He understands that each pupil is different and adapts to their own abilities and levels. 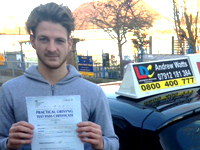 Andrew helped me to be confident driving a car and comfortable on the roads. With Andrew help I passed my theory and practical test in short time. I will always strongly recommend Andrew to anyone who is wanting to learn to drive. Thank you again Andrew. Driving with Andrew as an instructor was great he made everything seem so simple and put me at ease. 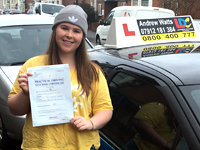 I didn't know anything about driving before I took lessons with Andrew but he made me feel confident behind the wheel and his relaxed manner made the lesson stress-free. I signed up for a 2 week crash course already having a little experience on the road with relations.... I met Andrew who picked me up outside my home address, and got on very well with him. I felt he was a very calm and experienced instructor. He taught me the correct way to drive and built my confidence for the test, which I then passed first time! I would recommend Andrew as anyone's instructor. First class instructor. At 36 years of age and after a few lessons 10 years ago I finally thought I'd bite the bullet & become a learner driver again. Andrew put me at ease straight away.His easy manner and calm approach made me settle in quickly.After my first lesson I felt confident knowing that he was the sort of instructor who would listen to his learners and try to tailor his sessions to their way of learning.Looking forward to the next lesson now thanks to his considerate style of teaching.